Even before I started recycling items to make crafts, I loved to go to yard sales to buy knick-knacks. When I found that the online store, Etsy, showcased the sale of vintage items (20 years or older), I knew I must participate … I figured that everything I owned was twenty years old or older. My Esty store can be viewed here. My favorite vintage finds are unusual, quirky, or humorous. I tend to gravitate to men’s neckties, buttons, teapots, plates, linens, Little Golden Books, planters, and figurines. Sometimes I combine the vintage items with others to create a new craft, such as a patchwork pillow cover made from men’s ties. 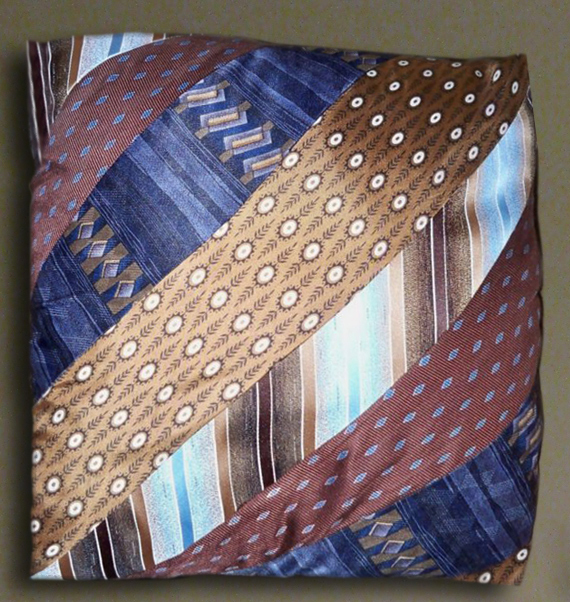 If no man you know will ever wear a tie again, but you are missing those rich colors and patterns and sheens, maybe you will find some joy in this little pillow. I create ways to repurpose your grandpa’s back-of-the-closet clothing into something you can display and use. Contact me if you have something you want preserved, and start making some new memories from them. To see examples of these vintage finds, click here.